Businesses who are creating a brand-new product may be aware that the expenses associated with the cost of developing the prototype, or first article, of that product can qualify for the Research & Development (R&D) tax credit1. Qualifying expenses can include employee wages, materials used in the construction of the prototype and any third-party contractors involved with the development. These rules have been well-established since 1981 when the federal R&D credit was first enacted. 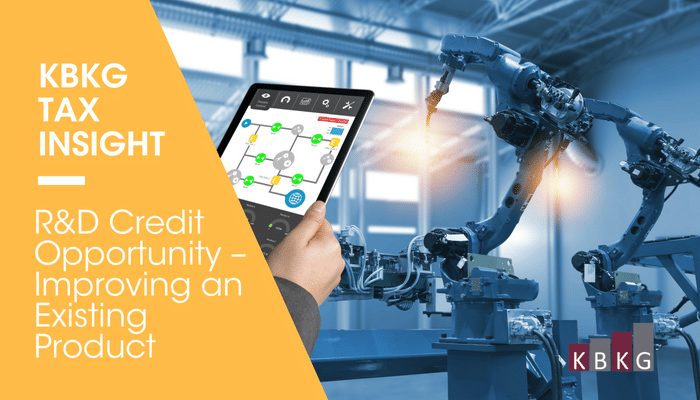 Every year, there are thousands of companies claiming billions of dollars in credits whose rationale for claiming the credit falls into this fact pattern. However, most taxpayers are unaware that the improvements made to an existing product may qualify for the R&D credit as well. This applies to product pulled from a company’s inventory as well as any products the company purchases with the intent to make significant improvements to either functionality, performance, reliability or quality2. The intent must be to create something better than what existed previously. Furthermore, the prototype may be sold or destroyed during testing, and it may still qualify for the R&D credit. The court case Missouri Corp. v. Comr.3 illustrates this concept perfectly. The Tax Court held that molds the Taxpayer purchased from a third party, and later sold to a customer after performing qualified research on them, was, in fact, a qualified supply eligible for the research credit. To understand this concept, it may be helpful to understand the difference between an “adaptation” of an existing product, the “substantially-all” rule and the “shrink-back” rule from the Treasury regulations. The regulations disallow the expenses incurred in taking an existing product and making only slight modifications to the original design4. The rationale is that adapting an existing product to a slightly different customer preference or use does not contain the requisite technical uncertainty, and therefore does not require much R&D. EXAMPLE 1: Generators ‘R Us (Taxpayer) manufactures backup generators for residential and small business use. One of its customers needed a small modification to an existing model for use in their business. The modification did not add functionality or improve the performance/reliability of the model and amounted to a simple reconfiguration of the existing technology. Additionally, there was no uncertainty as to the capability, method, or appropriate design to accomplish the adaptation. Therefore, the costs incurred with respect to this business component would be deemed non-qualifying. The regulations allow for including the entire cost of a prototype as a qualified supply so long as at least 80% of the prototype costs involve a process of experimentation5 (e.g., evaluating various materials, designs, processes, techniques and includes testing the prototype components to validate the design). The courts have also upheld the application of this rule in the Trinity case6, where two prototype ships were qualified in their entirety, including paint and insurance costs because the non-qualified costs constituted less than 20% of the total cost of the prototypes. EXAMPLE 2: Generators ‘R Us (same taxpayer in prior example) receives a new customer order for a new generator capable of operating while submersed in salt water. The company purchases four generators from a manufacturer of marine generators. Each generator costs $15,000. The company significantly improves the functionality and performance of 8 of the 10 existing components on the generator but also creates the membrane and venting system to allow for full submersion of the generator in saltwater. In this instance, greater than 80% of the cost involves a process of experimentation, so the taxpayer may claim the entire cost of the prototype as a qualified supply cost, including the purchase price it paid for the generators. To the extent the improvements made to an existing product account for less than 80% of the total cost of the product, the regulations allow the taxpayer to claim only those costs representing a significant improvement to function, performance, reliability or quality7. EXAMPLE 3: Generators ‘R Us (Taxpayer) receives a new order from a customer that desires to use one of the existing generators in a new capacity. This new use requires the design of a new internal component for the generator. Assuming there is no material improvement in the performance, reliability, quality or functionality of the generator in whole, the taxpayer is allowed to shrink-back the business component to the development of the new internal part. 1. Costs incurred with the design, development, fabrication, and testing of a prototype can qualify towards the R&D Credit8. 3. It may be placed back into inventory and sold to a customer. Just because the prototype is sold does not preclude its cost from qualifying for the credit. Although the R&D credit is a great incentive for companies who are designing and manufacturing new products, it is not a requirement. There are plenty of companies in various manufacturing sectors that purchase machinery and equipment for the express purpose of creating innovative components and systems to increase performance metrics, add new features and functionality, improve the stability or reliability of the various components or improve the overall quality of the product. As we have seen, a taxpayer may use its own inventory as a starting point in the development or it may purchase a piece of equipment or machinery with the intent of designing new (or significantly improving existing) components. The prototypes developed under these circumstances may be sold when the design is validated or scrapped if the design fails, but regardless of success or failure, the costs of the prototypes may be included as qualified supplies under Section 41.